I'm essentially trying to make an array of pins whose tips are in a sinusoidal shape. I started with a curve set by an equation, and made a sketch of it using projection. I made a conical shape at one end, with the point on the curve. I then tried to do pattern by curve, which sort of worked, except pattern by curve adjusts the axes so they're also normal/tangent to the curve (bad), and I get cones that aren't vertical. And managed to tweak it to my case. However, I now run into different situations, depending on how I proceed. I've also tried group all the components and done a pattern by curve, but it then distorts my axes, as it does the first time I attempted to use pattern by curve. I'm hoping somebody has a suggestion on how to fix this (or a better way to do this). Specifically, I am getting the impression that you don't know how to add reference entities to your sketches; when you say "When I do my sketch, it doesn't recognize the point, and when I do the revolve, it also doesn't recognize the point or give me a way to reference to it. ", it sounds like you are trying to click on that datum point on your sine curve as you are sketching the revolve's cross section. Try pressing ALT while clicking on this point. But this is just a shortcut for bringing up the References window, and specifying this point as a reference. Good luck! PTC didn't make it easy. Hi, is this what you want? Attached is the creo4 file for your reference. Hope it helps. I think you are making the solution to your problem too complicated. 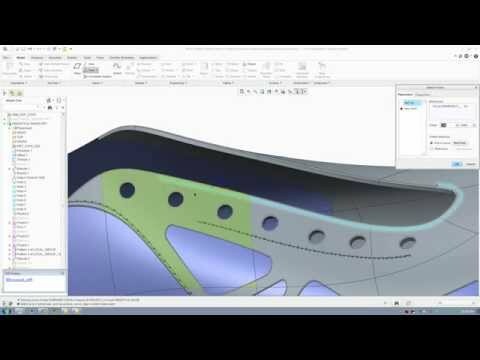 The youtube video shows techniques for when the pattern instances have to follow the spaced-apart locations on the curve and also satisfy some alignment along the curve direction. I think in following it, you made some mistake; the reason for axis flipping on you is likely due to an incorrect specification of the pin's sketch plane placement. Now place a datum point P0 on this curve (read on for explanation of why this point shows up as a sub-feature under the PIN feature in the above example). Then the next thing would be to build the PIN feature (revolve). It is important to be careful and use the P0 datum point as the only entity referenced by the pin's revolve section. Also note that the placement plane for the pin's revolve section is FRONT, and the TOP plane is the section's orientation plane. The pin's revolve section has the axis of revolution that is constrained to be vertical and coincident to the referenced point P0. After the pin feature is constructed and exists in the model tree, then it can be made to "absorb" the datum point P0. That's done by dragging the P0 feature onto the PIN feature in the model tree. Doing this makes the point P0 an internal datum of the feature PIN, and the dimension of this point (and therefore the pin's tip) is available for use as a basis of patterning the pins. Hi, it is, thanks! Unfortunately my Creo doesn't want to open the file you attached. Could it be a version mismatch? I'm using 3.0. Hmm I think I'm missing something. I have the datum point, but I don't have a way to connect it to my sketch or the revolve. When I do my sketch, it doesn't recognize the point, and when I do the revolve, it also doesn't recognize the point or give me a way to reference to it. Oops... I am on Creo 4. Let me know if there is anything else needed. Good luck. Thank you! That was what I was missing to use the point in the revolve/drawing. I also had to find an option under pattern that turned off 'Follow curve direction', otherwise it still turned my pins (and makes me wonder if it was an issue all along that I missed...). I really do appreciate the time and help. I've been learning Creo as I go which, as you say, isn't always easy or intuitive.